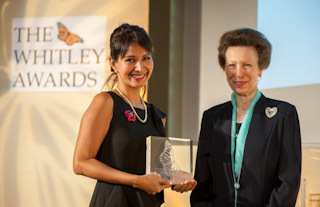 LONDON, UK: 9 MAY 2012 – HRH The Princess Royal (Princess Anne) tonight presented a Whitley Award for inspirational conservation leadership to Joanna Alfaro Shigueto of Peru for her work to build a better future for Pacific coast wildlife and fishing communities. Joanna, the head of the conservation non-profit ProDelphinius, received the honour during a ceremony at the Royal Geographical Society in London, hosted by Whitley Fund for Nature (WFN) – the UK-based charity which organises the international awards scheme. Her Whitley Award comprises a project grant of £30,000 – donated by Goldman Sachs – an engraved trophy, membership of the influential network of past Whitley Award winners and professional development training. The award recognises Joanna’s efforts to protect the many marine species which feed and breed off Peru’s long Pacific coast, including turtles, rays, sharks and Humboldt penguin, while also improving catches and profits for the many thousands of coastal families who depend on small scale fishing for food and income. The same ceremony also saw Dr Rodrigo Medellin of Mexico become the first-ever recipient of the newly-created Whitley Gold Award for outstanding achievement and an accompanying project grant of £30,000, donated by The Friends of WFN. As part of the ceremony, The Princess Royal and other guests watched a series of short films showing finalists at work. The screenings included a film about Joanna’s work narrated by the world-renowned wildlife broadcaster, Sir David Attenborough, a Trustee of WFN.